Catchy title huh? Before my skin went crazy and was just generally a bit dry, I used to use this stuff every day after I got out of the shower. It goes on lovely and light (as it's a lotion not a cream) so it's great for covering your whole body. It's not too greasy yet moisturising enough to use on your face. It's not perfumed and never irritated my eczema-prone skin, keeping it under control so I never had any flare ups. I haven't used it for a while so I'm not sure how effective it would be to combat very inflamed patches of eczema or whether it would still suit me now that my skin seems to have changed and gone all super-sensitive. I think I'll try it again soon and still if my skin still likes it. If your skin is just a little dry though I would definitely recommend Vaseline Intensive Rescue Moisture Locking Body Lotion. At a fiver for really big bottle it's very good value and because it's not thick and heavy it lasts quite a long time. NB Don't think that it's greasy like Vaseline petroleum jelly just because it's Vaseline brand, it's just a normal white-coloured moisturiser. 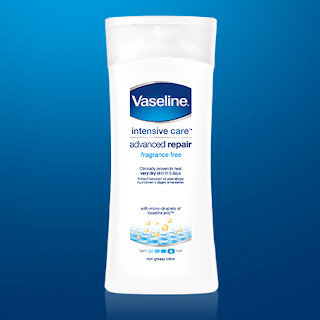 The Vaseline Intensive Rescue range also has a hand cream, a foot cream and something called Intensive Rescue Relief and Repair Balm, which sounds pretty good. I might give this a go too and let you know how I get on. New review of Vaseline Intensive Rescue Moisture Locking Body Lotion.